Yes, suicide is contagious, especially if it is legalized. This is not only because is leads others to consider it, but also, because it leads many to begin expecting and requiring it of the sick and dying. We have already seen this in the terrible effects of legalized abortion. Infants with poor prenatal diagnoses are aborted at rates approaching 90 percent. Parents in such situations are often pressured both by doctors, family members, and their own desires for a “perfect” child, to abort. To legalize killing is more than to simply permit it in rare circumstances, it is to unleash it; increase its numbers by widening expectations of when it can and “should” be used. One person’s “right” to legally commit suicide, eventually becomes my duty to commit suicide. This is NOT a merely private decision. Yes, indeed, suicide is contagious. Every human person who is growing elderly or struggling with physical or mental disability, or diagnosed with progressive illnesses such as Multiple Sclerosis, COPD, Alzheimer’s are going to be the first to come under threat. Those whose lives are diminished or weakened deserve special respect. Sick or handicapped persons should be helped to lead lives as normal as possible. Whatever its motives and means, direct euthanasia [or assisted suicide] consists in putting an end to the lives of handicapped, sick, or dying persons. It is morally unacceptable. Thus an act or omission which, of itself or by intention, causes death in order to eliminate suffering constitutes a murder gravely contrary to the dignity of the human person and to the respect due to the living God, his Creator. The error of judgment into which one can fall in good faith does not change the nature of this murderous act, which must always be forbidden and excluded. Discontinuing medical procedures that are burdensome, dangerous, extraordinary, or disproportionate to the expected outcome can be legitimate; it is the refusal of “over-zealous” treatment. Here one does not will to cause death; one’s inability to impede it is merely accepted. The decisions should be made by the patient if he is competent and able or, if not, by those legally entitled to act for the patient, whose reasonable will and legitimate interests must always be respected. Even if death is thought imminent, the ordinary care owed to a sick person cannot be legitimately interrupted (CCC 2277-2279). Thus the Catechism defines euthanasia/assisted suicide as the intentional ending of a life, whether by direct means such as injection with deadly drugs, or indirectly through the refusal to provide food and/or water. The distinction between euthanasia and assisted suicide lies in who initiates the final act that actually causes death, the patient himself (assisted suicide) or a third party (euthanasia). One cannot emphasize enough that simply refusing or withdrawing burdensome treatments, or allowing the dying process to proceed once it has naturally begun by not providing machines such as ventilators that are unlikely to be therapeutic, is not euthanasia/assisted suicide. Church teaching does not require that one pursue every treatment possible. The patient must discern carefully with information supplied by his medical team along with an assessment of his personal resources—spiritual, psychological, emotional, familial, and financial—whether or not a particular treatment is excessively burdensome. However, even for an imminently dying person, basic care (which usually includes nutrition and hydration, even if administered through a tube) must be provided. Pain management for those with terminal illnesses, for those with degenerative diseases, and for the dying is allowed and encouraged, even if the medication has the unintended side effect of shortening life. Arguments that dying is too painful and therefore a patient should be euthanized or assisted in dying are not valid, because it is very rare today that pain cannot be managed reasonably through advancements in the growing specialty of palliative care. Let’s consider some other reasons, both religious and natural, that we should oppose assisted suicide/euthanasia. I’ll begin with the natural reasons that should concern us all, including those of different faiths and those with no faith tradition. Then I’ll move to the religious reasons that should influence us who believe. Legalized assisted suicide will likely lead to poorer healthcare and increased pressure on the sick, the elderly, the disabled, and the traumatically injured. Those who advocate for the physically and mentally disabled have good reason to fear that pressure will be applied to euthanize the disabled and those who have been in traumatic accidents. As the concept of “a life not worth living” grows, and as the idea gains traction that disability (even milder forms) is a fate worse than death, those who struggle with disability may well be easy targets for those who advise suicide. Some may feel pressured to no longer be a “burden.” Many will have the sense of their dignity being lessened. More can be read here: Disability and Euthanasia – History and Concerns. As noted, granting individuals the right to end their life ultimately threatens us all because it implicitly denies the dignity of the dying. Failing to understand this dignity will lead to poorer care and will increase pressure on the elderly and dying to end their lives prematurely so that they are no longer a burden. In other words, the “right to die” too easily becomes the “duty to die.” What begins sociologically through pressure not to be a burden, soon enough becomes economically necessary because insurance benefits may vanish. And one can’t ignore the possibility of eventual legal pressure. The experience in the Netherlands is particularly sobering. More can be read on that here: Euthanasia Law in the Netherlands. There are many more reasons to oppose euthanasia/assisted suicide purely on rational grounds. You can find more of these here at the archdiocese’s Transform Fear website. Now I would like to move on to those reasons that originate from our faith in Jesus Christ. One of my privileges as a priest is to have accompanied many people on their final journey toward death. I’ve also accompanied their family members. In making these journeys, I have discovered that some of God’s greatest and most necessary work takes place in and during the process of natural death. Natural death is an important part of life that should be respected and accepted, not rejected. Some very important things happen on our deathbed that assist us spiritually, psychologically, and emotionally. These things happen not only to us but to our loved ones as well. I have seen pride melt away; I have seen powerful contrition for past sins emerge. I have seen gratitude intensify, both in the one who is dying and in the loved ones who surround him or her. I have heard beautiful words like, “I love you,” “I am proud of you,” “I will miss you.” I have seen people let go and let God take over. I have seen forgiveness, tenderness, appreciation, and love being shared as never before. There is also the beautiful gift of listening and waiting, along with the learning of lessons that will never be forgotten. I do not say that there is not grief and emotional pain; there is. But that is not all there is; there is beauty and love, too. And these are important and necessary. Perhaps some of the most necessary and profound things take place on our deathbed and at the deathbed of others. Supporters of the legalization of assisted suicide and/or euthanasia might argue that these beautifully human and transformative moments also occur when one takes death into his own hands. I have no doubt that many tearful goodbyes are shared and some reconciliation among family members occurs as well. But there is a very different quality and a transparent authenticity within these moments when one has surrendered his/her life and control of it over to God. The dying process helps us to receive the Kingdom of God like a little child, and God says this is necessary for us. As God directs Samuel, Do not look at his appearance or at his physical stature … For the Lord does not see as man sees; for man looks at the outward appearance, but the Lord looks at the heart (1 Sam 16:7). Even in the painful sight of once-strong individuals reduced to weakness, there is a kind of strange beauty and we must ask the Lord to give us the “eyes to see” (cf. Mt 13:16). In the nursing homes of this land are people who once ran businesses, raised families, and led communities. Now many have returned to a kind of childhood, even infancy. Some cannot walk, some have to be fed, some can no longer talk, some clutch dolls, and some must wear diapers. All this seems so horrible to many, but important things are happening. These are not conditions that any of us would willingly choose or wish upon another. However, not one of these losses, even the significant loss of intellectual capacity in such diseases as Alzheimer’s, diminishes worth or dignity. I do not want to minimize the pain that accompanies these losses—and the pain is not limited to the patient alone. Often family members and caregivers undergo significant stress and experience the pain of our Blessed Mother at the foot of the cross. But again, something important is happening. Are those in nursing homes really so different from you and me? Maybe death and dying are the “place” where all worldly status, all privilege, all inequalities are leveled and we simply become who we are. Are we not all little children to God? Does He not have to provide for every one of us in our need? Does He not have to feed us, clothe us, and enable us to speak? Perhaps it is just that with the elderly and dying the illusion of self-sufficiency has been shed. The Lord says, Unless you change and become like little children you will not inherit the kingdom of God (Mat 18:3). As Catholics, we can never affirm the world’s claim “My body is my own and I can do with it as I please.” For a believer, this is simply not true. Scripture says, You are not your own. For you have been bought with a price: therefore glorify God in your body (1 Cor 6:19). We are the steward, not the owner, of our body; we belong to God. As disciples, we seek to imitate Christ as He surrendered to His own impending death and gave us His Body at the Last Supper: This is my body which is given for you. Do this in remembrance of me (Lk 22:19). As Christians, we must once again reaffirm our acceptance of the cross. No one likes the cross—it is a stumbling block to Jews and folly to Gentiles (1 Cor 1:22)—but we have been taught by Christ that the cross is both necessary and saving. And we must insist, at least among our own number, upon the belief expressed by St. Paul: So we do not lose heart. Though our body is wasting away, our inner self is being renewed day by day. For this momentary affliction is producing for us an eternal weight of glory beyond all comparison, as we look not to the things that are seen but to the things that are unseen. For the things that are seen are transient, but the things that are unseen are eternal (2 Cor 4:16-18). Think carefully before you support assisted suicide/euthanasia through some notion of “compassion.” The truest compassion is to want for someone what he or she truly needs in order to be saved. Ultimately, only God can say what this is. We do not have dignity because we can control our own lives; we have dignity because our life is in God’s hands. The archdiocese’s Department of Life Issues and the Maryland Catholic Conference have been working with coalitions such as Maryland Against Physician Assisted Suicide to warn people about how the bills threatens vulnerable populations, including those who are sick, elderly, disabled, or who lack adequate, affordable healthcare. Suicide is Contagious! Don’t Let it spread. Please become informed and act against the legalization of assisted suicide/euthanasia. OUR STRENGTH IN TRUTH – A wise man is more powerful than a strong man, a man of knowledge than a man of might; for it is by wise guidance that you wage your war, and the victory is due to the wealth of counselors (Prov 24:5-6). OUR SURETY IN TIME – Be not provoked with evildoers, nor envious of the wicked; For the evil man has no future, the lamp of the wicked will be put out. … For the just man falls seven times and rises again, but the wicked stumble to ruin. Rejoice not when your enemy falls, and when he stumbles, let not your heart exult, lest the Lord see it and be displeased with you, and withdraw his wrath from your enemy (Proverbs 24:19-20,16-18). In the video below, a comedy routine from Mad TV shows how many modern notions were non-existent even just fifty years ago. In the sketch, a pregnant mother drinks a martini and smokes a cigarette; children ride bikes without wearing helmets. Of course, like a lot of comedy, the topic is taken to excess for effect. not everyone receiving an award. I can personally attest to the item about running in the cloud of spray behind the DDT truck. The cloud had a sweet, pungent order; we were told it wasn’t harmful and sure enough, none of us ever got sick from it. At left is a picture of mine to prove that I’m not lying! It was a little bit like the smell of newly mimeographed paper as the teacher handed it out—a strange but pleasant odor. DDT was banned in the 1970s and scientists still debate whether the lives lost (to mosquito-borne diseases) as a result of banning it outweighed the gains made by a purer environment. I leave that debate to them, but for the record, I am a survivor! The spiritual point I would like to make is one of moderation. I am not recommending that pregnant women drink or smoke. I am not saying that children should stop wearing bike helmets or that seatbelts are unimportant. Rather, I caution against prioritizing safety concerns to the degree that we become too fearful. Life involves risks, and there is no such thing as complete safety. I lived through many of the things on the list above and depicted in the sketch. In order to live we must take certain risks. A life too obsessed with dangers and too constrained by artificially imposed limits can smother and restrict. Some of the modern preoccupation with safety and for a life without any rebukes or challenges comes from a desire for excessive comfort and reassurance. Comedy like that depicted in the video below is funny because while over the top, it also has many elements of truth. I was interviewed on National Public Radio last year regarding a blog post I had written a few years previously about the movie “Toy Story.” The link to the interview is at the bottom of this post. You may wish to skip my written remarks below and just go to the interview instead, as it incorporates most of my reflections. There was a movie some years ago that most of you have probably seen called Toy Story. It had a profound impact on me, for it came out at a critical time in my life. It was my 33rd year of life and the 6th year of my priesthood. As I have related elsewhere, I had suffered a nervous breakdown that required a week in the hospital and a month off to recuperate. What drove me to that point was agreeing to take an assignment I really wasn’t ready for. I was asked to pastor a parish that was in serious financial trouble. The stress nearly finished me. Invincible? I was a young priest at the time, still in my “invincible” stage, when I thought I could do anything. I guess it’s fairly common for young men to think they can handle anything. During those years, opinions are strong, dreams are still vivid, and hard experiences have not yet taught their tough lessons. So, this young priest said “yes” to the assignment, even though I had reservations. Soon enough, the panic attacks came, followed by waves of depression. There were days when I could barely come out of my room. A week in the hospital for evaluation, a month off to recuperate, and years of good spiritual direction, psychotherapy, and the sacraments have been God’s way of restoring me to health. Somewhere during the early stages of my recovery, I saw the movie Toy Story. Right away, I recognized myself in Buzz Lightyear. Buzz begins the movie as a brash, would-be hero and savior of the planet. Buzz Lightyear’s tagline is, “To infinity … and beyond!” The only problem is that he seems to have no idea that he is a toy. He thinks he has come from a distant planet to save Earth. Buzz often radios to the mother ship and, hearing nothing, concludes that she must be just out of range. At a critical point in the movie, it begins to dawn on Buzz that he is just a toy and may not be able to save the day. He struggles with this realization and resists it. He tries to leap to the rescue, not knowing he can’t really fly, and falls from the second floor breaking off his arm. Suddenly, Buzz realizes he’s just a toy, that all his boasting was based on an illusion. Buzz then sinks into depression, his sense of self destroyed. But God wasn’t done with Buzz Lightyear. In the end, Buzz does save the day, by simply being what he was made to be: a toy. One of the neighborhood kids, Sid, straps Buzz to a rocket, intending to launch him high in the air. In the end, that enables Buzz to “fly” and save the day at a critical moment. Although Sid meant Buzz’s launch to cause harm, God meant it for good. The humiliation Buzz suffered enabled him to conquer his pride; it made him able to save the day. The lesson of the movie is a critical one and certainly the lesson I learned in my own personal crisis. The lesson is that our greatness does not come from our inflated notions of our self but from God. God does not need or want us to pretend to be something we are not. He wants us to be exactly what He made us to be. It is often through our weakness that He is able to do His greatest work. 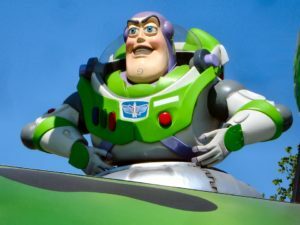 Just as Buzz comes to realize that he is just a toy, I have come to realize that I am but a man. I have certain gifts and lack others. Some doors are open to me and others are not. When I accept that and come to depend on God to fashion me and use me according to His will, great things are possible. If we go on living in sinful illusion, we miss our true calling and our proper place in God’s kingdom. Ultimately, each of us must come to discover the man or woman that God created us to be. That is our true greatness. It is often through our weaknesses and humiliations that we learn this best. All this from a children’s movie!